Our carpet stain remover for dry stains has been in the market for more than 20 years and it's the best selling carpet stain remover in New Zealand by a significant margin. You can find it in the cleaning aisle of most supermarkets. "Cavalier Bremworth Stain Remover did as it said and bingo, no stain. Thank you again, it's nice to see a product do what it says." – H Milliken, Wellington. It's designed to work on most food, drink, oil and grease-based stains and is suitable for wool and synthetic carpets and rugs. It's effective on almost any dry stain that has not caused a chemical reaction with the carpet fibres. If our product doesn't remove it, then it's doubtful anything else will. For information on a specific stain and how to treat, please see our stain cleaning guide. Never rub a wet carpet as it damages the fibres. Our stain remover is designed to be lightly applied as a spray and then the resulting powder vacuumed up using a fine nozzle. Please note this product is a flammable aerosol and should not be used in a confined space or without adequate ventilation. "What a fantastic product. A forkful of butter fell off a heap of freshly cooked asparagus as I carried it to the table, all onto my landlady's lovely plain greyish carpet; been here 6 years and NEVER spilled a thing until last week. Tried mopping with paper towel then all week have been rubbing and gently scrubbing with washing-up liquid and warm water, it just got worse. Then I read online about your product, rushed into town and bought some and oh my goodness, it's magic. Two quick sessions and it's gone, even after a week of soaking in and spreading. Feel like shouting it from the roof-top. Thank you for producing a miracle. Best wishes (and I will NOW enjoy Christmas!)." - Gwen Arnold, Hastings. "Ranui House has 26 apartments which accommodates patients and their families from all over New Zealand. We are usually full and with so many people coming and going it does cause many marks to appear on the carpet. My cleaners think your carpet cleaner is wonderful and makes their job a lot easier." - Allison Nicol, QSM, CEO of Bone Marrow Cancer Trust, Christchurch. "Dear Cavaliers. My husband and I threw a party last Sunday and were horrified when someone tipped a whole jar of tomato sauce over our beautiful white rug. Actually it's a black rug with a white pattern in parts, but naturally the tomato sauce landed on the white section. We tried to wash it off as best we could but no matter how many times we tried and with whatever product, the pink kept rising to the surface. We asked in a carpet shop what product we could use and were told NOTHING would get it out, that it would have to be professionally cleaned. 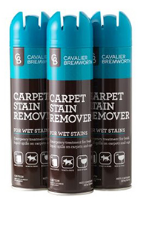 "Three days later we found your product 'Cavalier Bremworth CARPET STAIN REMOVER FOR DRY STAINS'. This product is magic! Not only fast (it removed the stains instantly) but it showed how white the white should've been so we did the entire rug. It now looks brand new. We then started on our stairs, which we'd paid a carpet cleaner $100 to clean only 2 weeks before and VOILA!! They came up like new, so much better than the professional with all his equipment. We're now going out to buy a stack of cans of this product, plus your stain remover for wet stains to have it on hand just in case." - D Kincaid, Brisbane. "We have a machinery dealership and our carpets get grease and oil on them occasionally from the workshop. I have used and recommended your carpet stain remover and it is truly excellent." - P Nock, NSW. 70% of all carpet stains are wet so we developed an emergency wet stain remover that acts instantly to treat wet stains on all carpets and rugs. It's available in the cleaning aisle of most supermarkets and also through our network of warranted dealers. The wet stain remover works by applying soft foam, which dissolves into the stain and helps lift it off the carpet when blotted up with a clean, dry paper towel. Repeat applications may be necessary depending on the type and strength of stain. As with all carpet spills however, the first step is to 'contain the stain' so it doesn't spread any further, before applying any stain treatment. Firmly blot up the excess liquid with clean, dry paper towels before you use the wet stain remover. When you've just spilled something, it's tempting to throw water or other liquids directly onto a stain, but resist the urge! Too much liquid will only spread the stain further and can damage the carpet backing. Our new wet stain remover has been thoroughly tested to ensure that no rubbing of a wet stain is required. That can permanently damage the carpet pile and unfortunately, it's something that other carpet cleaning products recommend. Trials with our new wet stain product have proven it to work well on troublesome stains and is one that most homeowners should keep on hand 'in the event of an emergency'. Please note that when using this product on red wine stains, you may notice the stain take on a green or brown hue as you apply the foam. This is due to the cleaning agent reacting with the chemical that contributes to wine colour, as it works to break down the stain. The extent to which this happens is entirely dependent on the type of red wine. Again, the most important thing is to firmly blot up as much of the red wine as you can before applying the wet stain remover. Continue to reapply the foam and re-blot the area until no further colour is left on the paper towels. As the carpet dries, the stain should lift further. "The most impressive result was when my dog cut his foot and walked on our carpet. The Wet Stain Remover got the blood out pretty much first-go and it left no marks. Our new puppy has had one or two 'accidents' too but the wet stain remover worked very well and removed the odour which prevented him going back to that spot." – Nicholas S, Rotorua. "We did the paper towels first on the red wine but still had residue left. The wet stain remover got it all out and no evidence the next day of quite a large wine spill. Magic!" – Brian K, Christchurch. "Can't believe it got a mix of red wine and dare I say vomit out of a light coloured carpet – took it all out without a mark left on it and smelled much better too!" – Merilyn R, Auckland.